A appropriately treated thin metal band is drawn to diamond gauze plate with appointed specification, which cuts down the complex procedures of drawing wire and knitting mesh, while the packing still has the excellent wetting ability and separation performance of wire gauze packing. Mellapak packing is available in a wide range of materials, include stainless steels, 304, 316, 316L, Carbonsteels. Aluminium, copper bronze etc. Further materials available on request. 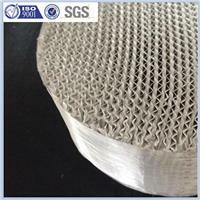 ◆ Atmospheric rectification and vacuum rectification, application fields similar to metal wire gauze packing and special technology such as requiring titanium or aluminum gauze packing. ◆ Substituting for random packing and revamping some tray towers in appropriate conditions. ◆ Absorption requiring low resistance and distillation with heat pump.